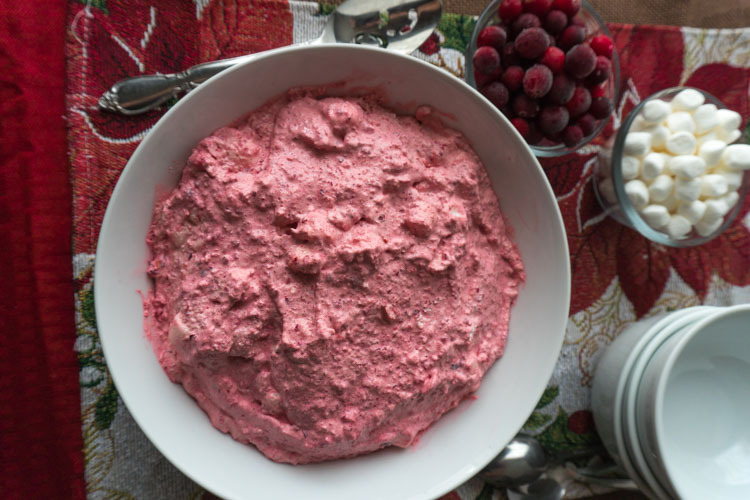 You guys have got to try this creamy cranberry salad! It is so amazingly delicious and super light and fluffy. 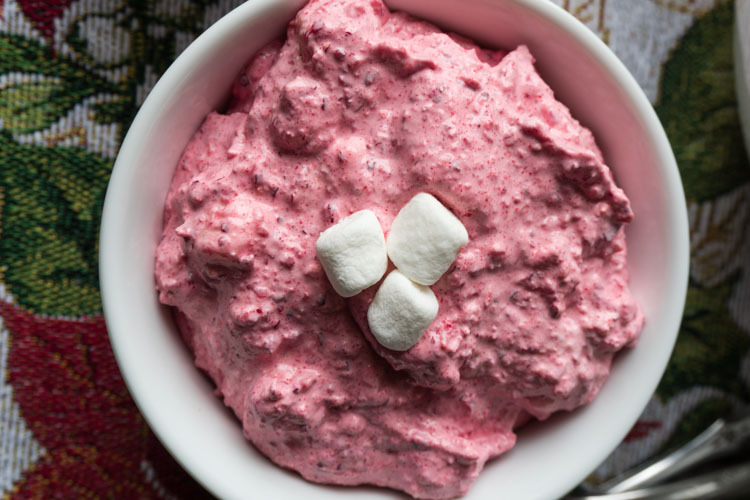 It has all the flavor of cranberries combined with the tanginess of an orange and then the fluffiness of not only cool whip but marshmallows! AMAZING! When I was trying to come up with a cranberry salad I knew I had to do two things. 1. Start with the best cranberry sauce base- which is actually a cranberry relish. And 2. Call my mom! Now let me explain…. First off, ever since I can remember, every Thanksgiving and Christmas we have had cranberry relish. I never understood why people would eat cranberry sauce from a can or cooked cranberries, except, I figured, they had never tried cranberry relish, so they just didn’t know better. Well, the relish is still a holiday staple even though I’ve moved out on my own and gotten married. 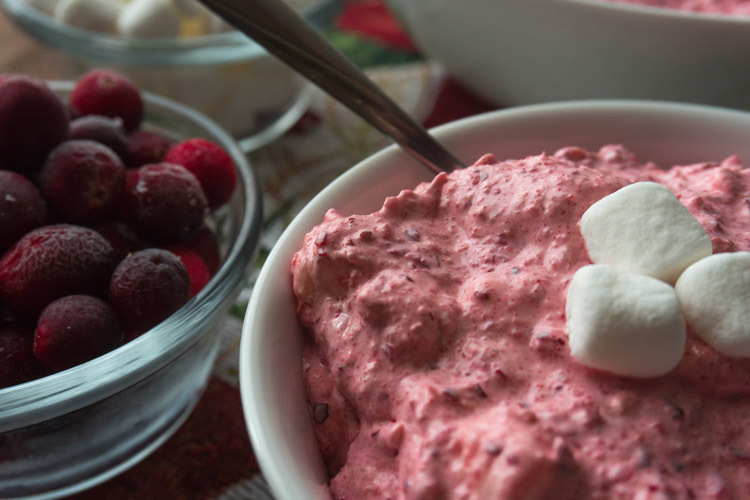 It is simply a cup of frozen cranberries, 1 cup (or less!) of sugar and one orange (with the peel left on!). You throw those 3 ingredients in the food processor and blend! It is amazing. And in recent years I’ve come to find out the relish is the recipe on the back of the cranberry package! Regardless, my mom has always made it and it is now and will always be her cranberry relish. Okay so now that I explained the relish, let me explain calling my mom. Every year for holidays, she also makes Orange Salad. Her Orange Salad, contains crushed pineapple, canned mandarins, cottage cheese, cool whip and orange jello powder and maybe a few other things that I can’t recall. Nevertheless, it’s really really good and it’s creamy and fluffy and amazing. So I needed her advice on how to make a cranberry version! Well I took the relish and added the cool whip, orange jello and marshmallows (because I love marshmallows and couldn’t resist!). I made sure to fold it all together so there were no dollops of cool whip left, per my mother’s instructions, and then tasted it. It was amazing and truly now something I will make for holidays to come! 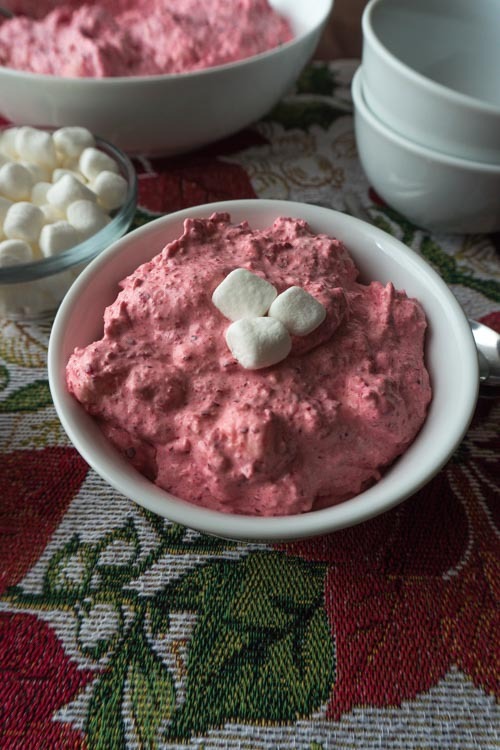 You have got to try this cranberry salad with cool whip. Seriously, it is approved by my mom and taste tested and loved by me! For other yummy holiday treats try these eggnog cupcakes, or this eggnog cheesecake! YUM! This easy cranberry salad is out of this world good! It is light and fluffy and oh so delicious! Look through the cranberries and toss out any that don’t look good. 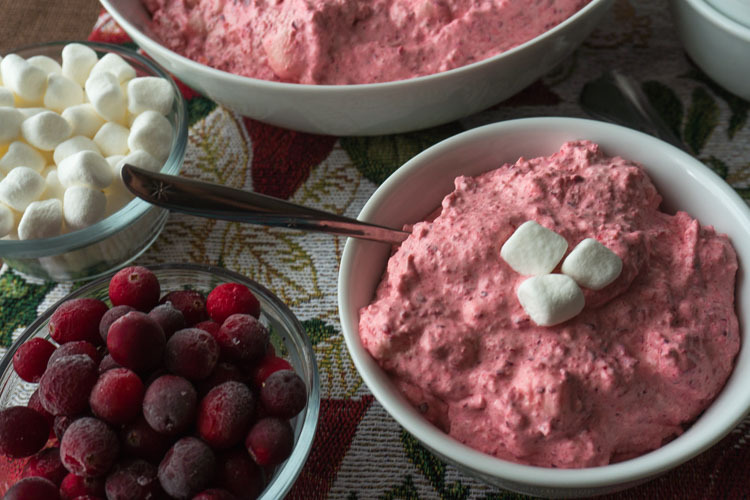 Pour frozen cranberries into food processor, or high power blender. Transfer to a medium size mixing or serving bowl. Add jello powder and mix thoroughly. 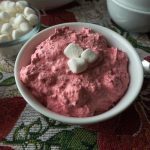 Fold in marshmallows and cool whip. You want to make sure the cool whip is fully incorporated, but only just! Over mixing will make the cool whip deflate.